Everyone benefits from companies that hire and train their own employees, as we do – for this reason and others, we do not hire sub-contractors. This provides for a more stable workforce, mandates workers’ compensation, and makes an investment in our employees’, and our communities’, future. We encourage our employees to take the time necessary to develop a quality product, rather than race to the finish. Because of the WoodGuys’ commitment to them, our team members are invested in the good name and success of our company. This helps create an atmosphere of great customer attention. We treat our team members with respect and in turn we all treat our clients with respect and responsiveness – we help to educate our clients about our processes and materials – and why that matters! We deliver the best in quality, which for us, it isn’t just a statement, it’s about keeping our commitments. We believe in exceeding our customer’s expectations – not just being the ‘best’ but being the best for each individual client. It’s about being on time, maintaining a clean workspace, sustaining clear precise communication – it’s about promising what we’ll do and delivering on those promises. 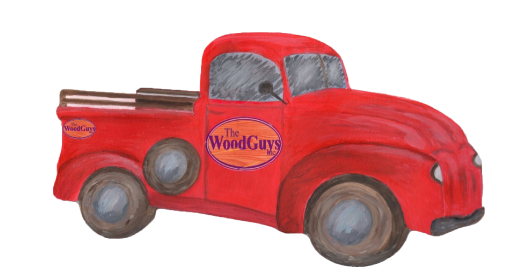 With The WoodGuys you don’t have to worry! We’re committed to continuously improving our products, processes, equipment and training so that you, the client have a great experience and receive great goods. We are consistent and work on our people, products and processes through ongoing attention to and support of the details that have made us who we are. From soup to nuts, we finish what we start. When you work with The WoodGuys, you don’t have to put together your project from multiple sources, we take care of everything so that you don’t have to. Because we hire talented, resourceful, inspired team members, they are great resources to help find creative solutions to the problems and opportunities that we face every day. For everything from the way a custom piece of furniture needs to work in your space, to wood species and stain colors, we will work with you to develop the style that works while providing the very best in functionality. Because wood is available in many species, sizes and shapes, it is suitable to almost every need. It has a high ratio of strength to weight and a history of excellence in durability and performance as a structural material. It’s the only raw material that is at the same time renewable, biodegradable, recyclable, durable, versatile, energy efficient and extremely beautiful! We are a privately held creator, builder, installer, distributor and servicer of high-end custom wood furniture, casework & built-ins, stairs, handrails and hardwood flooring located right here in beautiful Denver, Colorado. Come by our Showroom or call and let’s get to know each other. We’re here. We’ve been here. We will be here. Our long list of happy, returning clients will attest to the degree of care and personal responsibility we put into each and every project. We are proud of the work we’ve done and the friends we’ve made doing it.